Keep workspace accessories within reach and easy to find with the BAFFECT Desk Organizer, Black. Storing frequently used items in the handy desktop caddy makes a convenient, time-efficient alternative to rummaging around in drawers searching for what you need. The organizer provides useful storage space. The thoughtfully designed organizer keeps all those must-haves right at your fingertips. Pens, pencils, markers, and more stand neatly upright thanks to the organizer's divided compartments. Storage box with organizer top and 1-shallow and 1-deep drawers. Built-in organizer top for accessibility; A Smooth PP Coating Feels Great to The Touch, clear drawers to easily identify contents. BEST OFFICE ORGANIZER FOR WOMEN A GREAT GIFT: We use unique design for this modern desk organizer,it looks cute and free standing.Suitable gift for boy/girl/teen/men/women,and we use gift box package.The desk organzier is a great gift for Christmas/New Year. 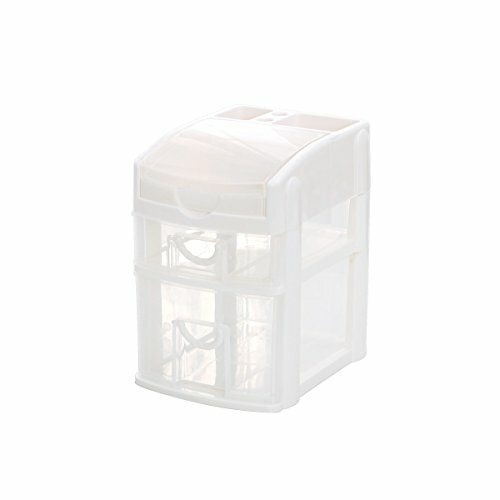 MODERN OFFICE ORGANIZER OVERALL SIZE: 8.3in L x 7.5in W x 5.7in H, MATERIAL: White PP for out frame and white PP for drawers. If you have any questions about this product by Baffect, contact us by completing and submitting the form below. If you are looking for a specif part number, please include it with your message.